I hope your hopping along for inspiration to the Dreamweaver Stencil's January Lose Some Weight Challenge, or in other words…..CLEAN AND SIMPLE!!! 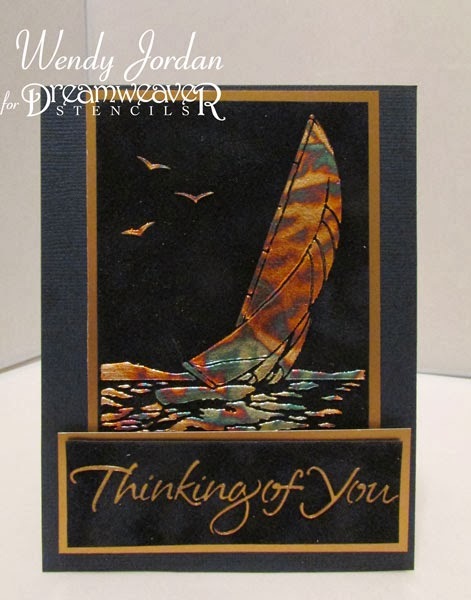 My chosen stencils today are a DW new release, Sailboat (LG755) and an older sentiment stencil, Thinking of You (LM146). I love the simple elegance of the Gold Leafing Technique. Take a few minutes and watch a step by step video I made using this technique. See what the Dream Team has been creating for the challenge. You can enter your Lose Some Weight Challenge entries at the Dream It Up Blog. Somehow I left my comment on my blog instead of yours! Great card I love the leafing on the sailboat! This is one of the most beautiful cards I've ever seen...love the contrast with the velvet background paper and the variegated metallic leafing technique that you have rendered. Great work WEndy!!! Amazingly beautiful card, Wendy! I never thought to leaf it! Thanks for adding the tutorial. Oh my, this is a gorgeous card! Oh my what a great look at that golf leafing makes on both your ship and the Christmas card. Never saw this done before. It's an awesome technique and you demonstrated it so well.